I appreciate thrift stores in the winter, but yard sales are a richer vein to mine. Where else can you buy something for a dime or a quarter? Even candy costs more than that in stores today! Anyone looking to perfect her yard sale technique should read Amy Dacyzn's Tightwad Gazette (you know I think you should all read the book, anyway!). She has a very organized strategy for acquiring her family's needs. Mine's more hit-and-miss. Also, gas prices have limited my range lately. We go as a family. We look at the listings online the night before and make a short list. Depending on what looks best, we get to our first one by seven am, then stop at sales as we make our way home. My husband and I split up when we unload, and between us, canvass our respective areas of expertise in record time. Buckling the kids in and out of the car seat is our biggest effort! Andrew gets a quarter to spend on whatever he wants. (He's learned that he gets a lot of free things from little old ladies, too, especially if he uses good manners!) If the sale looks slim, one of us will stay in the car while the other makes a quick pass. We don't need much. Whether you find that $400 fly rod for $1.50 (getting the "best wife ever!" award) or bring home an extra tub of nails for the kitchen remodel, yard sales can be a productive--and exciting--family outing. Tomorrow I'll give you my rundown on the four types of yard sales and which ones are most lucrative. Hint: it won't be the yard sales in this neighborhood. I would put up with the neighborhood for the Playmobil dollhouse! 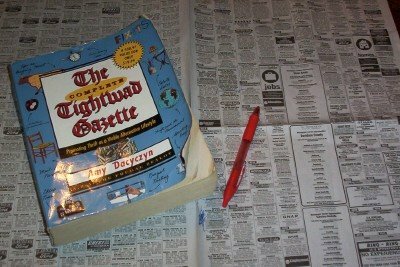 I received the Tightwad Gazette when it was a newsletter and absolutely loved it! I have all three books, but I tend to forget about the ideas, so I periodically re-read them. I haven't been to a garage sale in quite a while. Gas has gotten so expensive! I like to go when there is a whole neighborhood I can tackle at once.